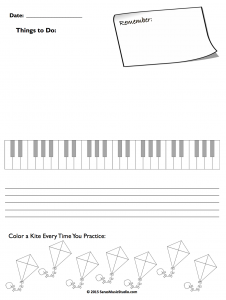 Here are some spring themed beginner piano assignment sheets. There are 13 different designs, including ones that you can use for St. Patrick’s Day and Easter. Each sheet includes a “sticky note” section for an overall goal or reminder, room for assignments, keys and a staff, and a way for students to keep track of their practice. Heres what the layout looks like! Typically I print several copies of each design, and then let my students pick which design they want to use. Any leftovers can always be stashed away for next year. Remember, you don’t always have to print the entire file — just select the pages that you need! You MUST save the PDF to your computer to ensure that all the images will print out correctly — otherwise some lines or images may not appear. To Print: This is a PDF file. Use Adobe Reader or a similar program to open and print. Image Credits: The piano and staff are © SarasMusicStudio.com. All Spring themed graphics are created by MyCuteGraphics.com and are used with permission.